TORONTO, ON – More than a year after it was first announced, and following a week of preview events and soft openings, CRAFT Beer Market Toronto will be officially opening tomorrow (December 6th) at the corner of Yonge and Adelaide in the city’s Financial District. Building on the successful model of the previous locations in the chain, the two-level and 400+ seat establishment features more than 160 draught beers – the largest tap line-up in Ontario – along with a selection of premium wines and spirits, and a food menu focused on “New North American Classic Cuisine” made from scratch with locally sourced ingredients. 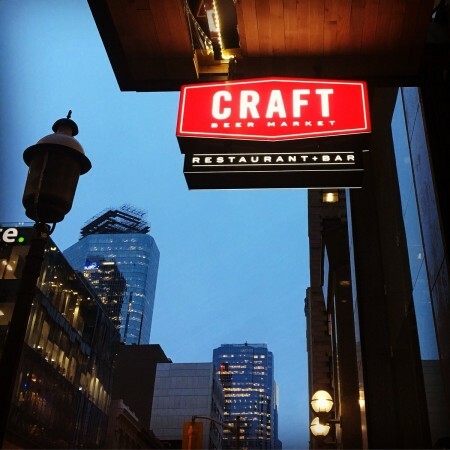 CRAFT was founded in Calgary in 2011, with branches now open in Vancouver, Edmonton, Ottawa, and a second Calgary location. CRAFT Beer Market Toronto will be open for lunch and dinner daily, and brunch on weekends. For more details, see the website, Facebook page, Twitter feed and Instagram account.